Our vSOC service is designed to support organisations requirement for Cyber Security & Security Monitoring. Allowing for requirements gathering, design, handover and training of staff to operate the Cyber security operations centre. We offer three vSOC services – Classic, Enhanced and Supreme. Each service is designed to meet and address our customers Cyber security requirements compliance obligations. The specific features of each services is as shown below. Please do not hesitate to contact us today for a free quotation, and discovery workshop to get your organisation protected. Please checkout our G-Cloud v9.0 product page, and contact us straightaway for inquiries. Our vSOC service is designed to support organisations requirement for Cyber Security & Security Monitoring. Allowing for requirements gathering, design, handover and training of staff to operate the Cyber security operations centre. The vSOC service – CSOCs, SSOCs, SIEM allows protective monitoring logs, threat intelligence feeds, CERT and vulnerability information fusion. We are pleased to inform you that we have gained the Cyber Essentials Plus certificate. We are proud of the work we have put in to achieve this milestone, and it goes to demonstrate our commitment to our customers and partners, and our drive to a good stewardship to Cyber Security. 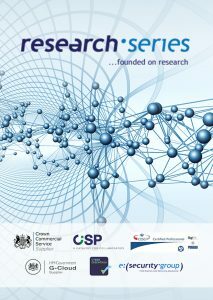 Cyber Science – Pioneering Research & Innovation in Cyber Situational Awareness & Cyber Security. The Cyber Science series is a multidisciplinary discipline devoted to the advancement of Cyber Situational Awareness, Social Media, Cyber Security and Cyber Incident Response. 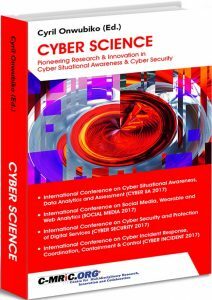 Its aim is to discuss and disseminate topical, timely and emerging original innovations and research results in cyber situational awareness, security analytics, cyber physical systems, social media and wearables, protection of online digital service, cyber incident response, containment, control and countermeasures (CIRC3). The four areas that make-up Cyber Science each provides unique insights: CyberSA is dedicated to the advancement of the principles, methods and applications of situational awareness in Cyber Systems, Business Information Systems (BIS), Critical National Infrastructure (CNI), Computer Network Defence (CND), Cyber Physical Systems (CPS) and Internet of Things (IoTs). Social Media is dedicated to the advancement of Social Media, Security of Social Media due to consequential impacts and risks arising from compromise or security breaches. It covers economic importance of Social Media, the emergence of Wearables, Wearables for Fitness, e-Health and life style improvements, and the use of Web Analytics for social media enhancements, Business Intelligence and Business Empowerment. Cyber Security is dedicated to the advancement of Cyber Security, Information Security, Network Security, Application Security and Business Transformation of Digital Services, and the Protection of Public Digital Services, especially high value bearing online services. Cyber Incident Response is dedicated to the advancement of Cyber Incident Response, Coordination, Containment and Control, Digital Forensics, Cyber Incident Response and Forensic Readiness, Legal Readiness, Cyber Incident Response Plan and Preparedness.